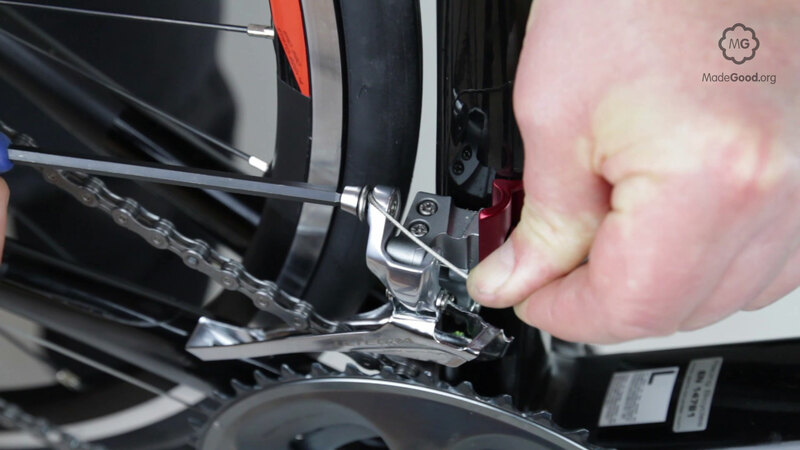 To begin front derailleur adjustment, Identify the two screws that limit the movement of the front derailleur, they may be labelled ‘L’ and ‘H’ or ‘LOW’ and ‘HIGH’. If they aren’t labelled check the manufacturers service information on-line, or use trial-and-error to discover which does what. The purpose of these screws is to let the chain move across all chain-rings and no further. Unclamp or dismount the cable. Turn the pedals forward. 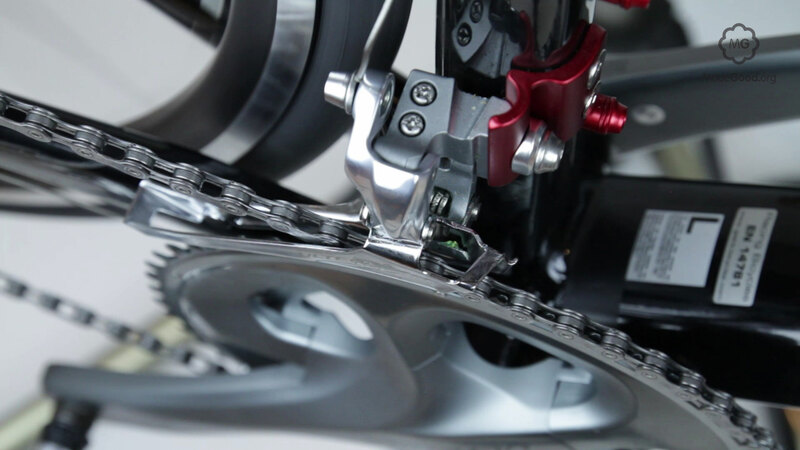 If the chain rubs on the inner plate of the derailleur cage turn the low limit screw anti-clockwise to allow the spring to move the cage left until the interference is gone. Otherwise screw in the low limit screw to move the cage right until the chain brushes it, then go back a quarter turn to silence the rub. 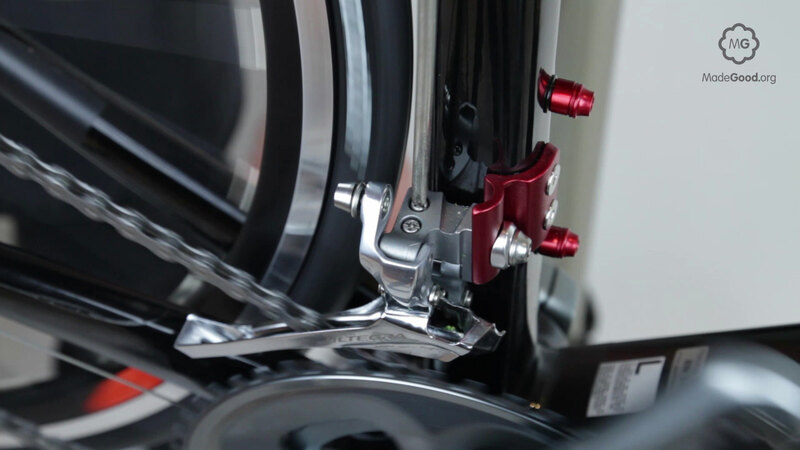 Select the lowest gear in the shifter and close down any barrel adjusters on the cable run. These may be where the cable exits from the shifter, at a stop on the frame, or just mounted in-line on the cable. 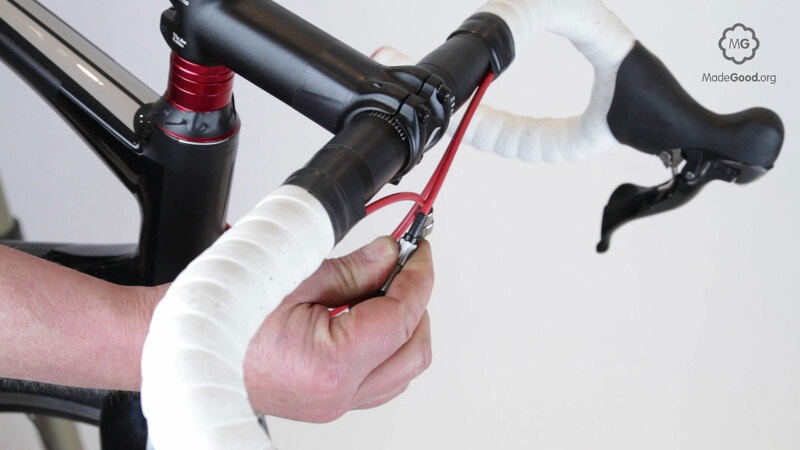 Remount or reclamp the cable. The cable should be neither lose nor tight but passive between the shifter and derailleur. If the cable is new pull on any exposed length of inner cable to compress the ferrules and outer-cable into position. 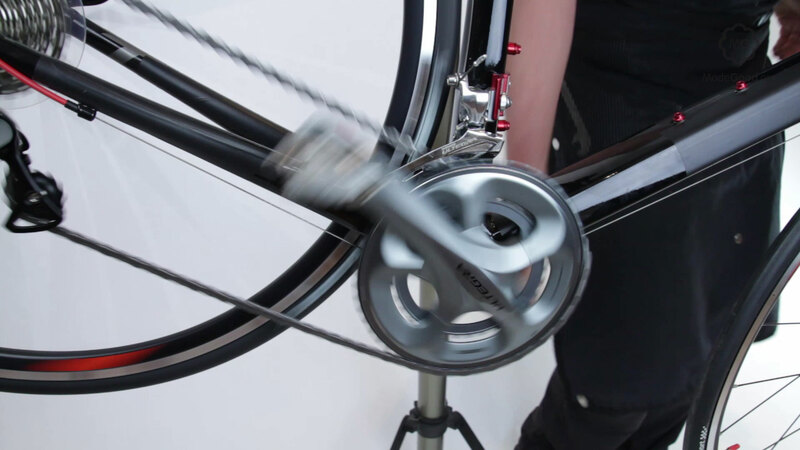 If there is no exposed length of cable you can do this by pedalling and shifting onto a larger chain-ring. Unclamp the cable and take up any slack that results from this stress test. Click the shifter while turning the pedals. Turn the barrel adjusters to tighten the cable until the chain shifts onto the next chain-ring. Some front derailleur shifters have sub-clicks that are not for changing gear but to allow the cage to move enough to eliminate rubs on the chain. 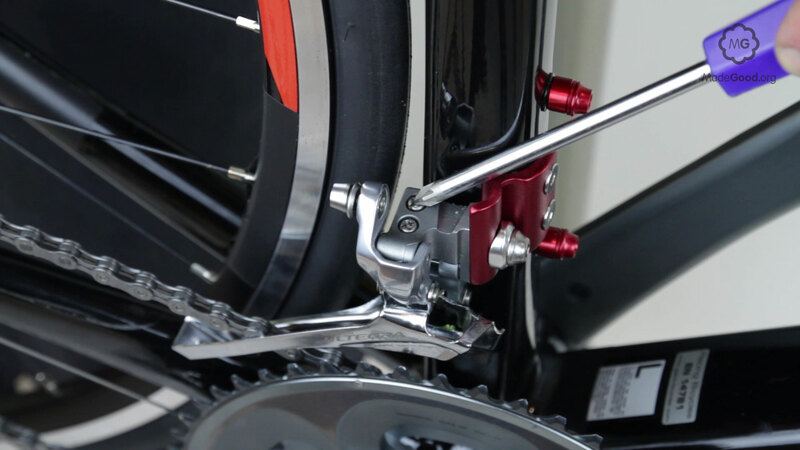 Pedal and use the shifter for the rear derailleur to select the highest gear – the smallest cog wheel – on the rear hub. If the bike has three chain-rings make another shift onto the biggest chain-ring. 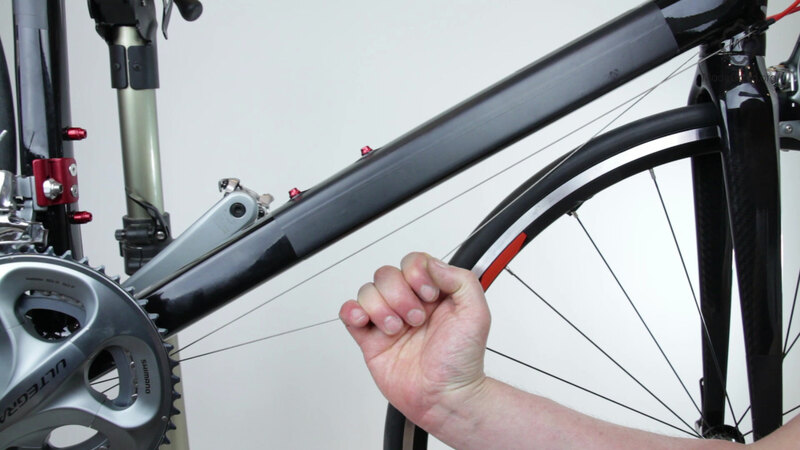 You may need to tighten the cable with the barrel adjuster while pedalling to enable the chain to move. If the bike only has two chain-rings it’s already there. Turn the pedals forward. 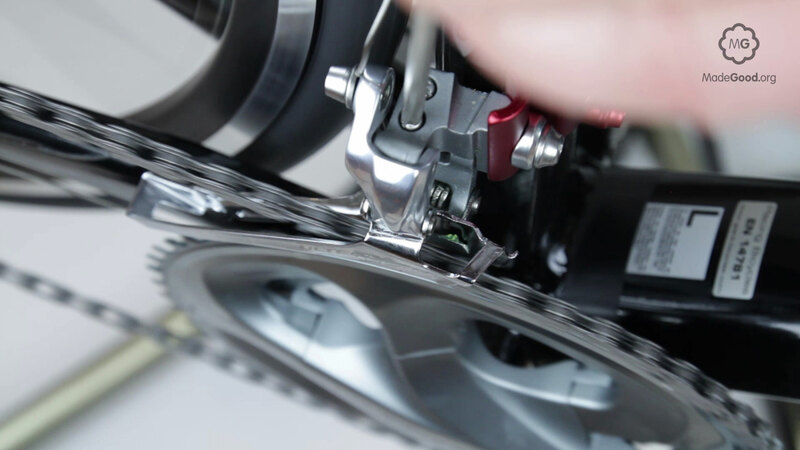 If the chain rubs on the outer plate of the derailleur cage turn the high limit screw anti-clockwise to allow the cable to move the cage right until the interference is gone. Otherwise screw in the high limit screw to push the cage right until the chain brushes it, then go back a quarter turn to silence the rub. Work the front derailleur to shift the chain between the chain-rings. If the chain is slow to up shift onto a bigger ring tighten the cable. 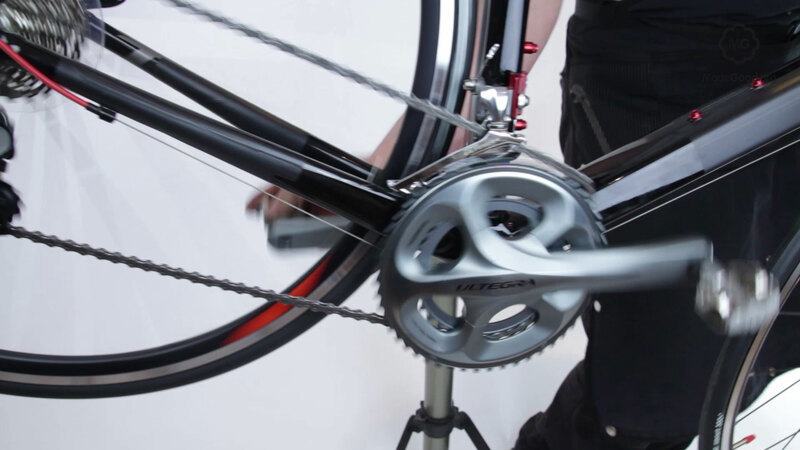 If it is slow to drop onto a smaller chain-ring loosen the cable. Pedal hard and shift brutally to check the chain can’t be thrown off. If it falls off to the left tighten the the ‘L’ screw a quarter turn and check again. If it falls off to the right tighten the ‘R’ screw a quarter turn and check again. Repeat all these tests in the highest and lowest gears at the rear hub. If the chain rubs in oxymoronic gears – big to big or small to small – this is not a problem as these gears aren’t at the extremes of the gear range.